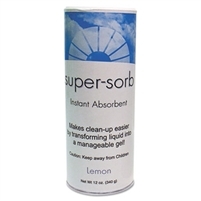 Fresh Products Super-Sorb Vomit Cleaner Granules Absorbent for Blood, Urine, Vomit, Puke, Throw-up, and other liquids. Absorbs 60 times its weight immediately! Easy, sanitary disposal of blood, vomit, urine and other liquids from hard surfaces. Saves cleanup time—simply sprinkle granular absorbent onto spills, sweep up. Quat and microbiocide eliminate odors. Ideal for use in grocery stores, restaurants, hospitals, nursing homes, day care facilities, health clinics, Child Care Centers, Carnival Rides, Bars, Night Clubs, etc. Includes Six cans of 12 ounces each.